Entering the one train at Van Cortlandt Park and taking it down an hour to Wall Street can feel like going from one world to another. The segregation of New York City’s different neighborhoods by income level is part of a very deliberate and racist history in New York’s recent past, starting in the 1950s and continuing on until today. Government-sanctioned discrimination disallowed people of color from buying homes in the suburbs and denied them mortgages so they were forced to stay in public housing projects in the Bronx. All of this happened while white military veterans’ home purchases in the suburbs were being subsidized by the government through the G.I. bill. If a white family was purchasing a suburban home too close to a “red” district (one that had people of color in it), then the government would not approve their low-interest loan. This practice was known as “redlining”. Ultimately, this whole process prevented people of color from accessing resources and, eventually, prevented them from accumulating wealth (The House We Live In, 2003). One of the results of this racist legacy was the creation of food deserts, which are just as persistent a product of redlining as school segregation. The US Department of Agriculture (USDA) defines a food desert as an “area in the United States with limited access to affordable and nutritious food, particularly such an area composed of predominantly lower income neighborhoods and communities” (Breneman et al., 2009). 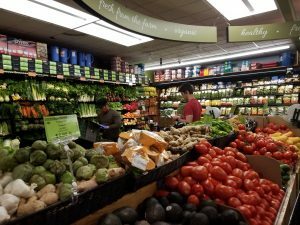 While efforts have been made to increase the amount of fresh food there is in low-income neighborhoods through initiatives such as increasing the number of produce carts and greenmarkets, the amount of food does not matter if people cannot afford to pay for it. The New York City government Food Policy department defines food insecurity as “the lack of access, at times, to enough nutritionally adequate food for an active, healthy life for all members of a household” (Turk, 2017). One of the ways the city has worked to make fresh produce more affordable to low-income residents is by allowing Supplemental Nutrition Assistance Program (SNAP) benefits to be redeemed at produce-carts and at all of the NYC greenmarkets. These benefits stretch out the value of a dollar so that more food can be bought for less money. In 2017, GrowNYC SNAP sales were more than a million dollars, showing the success of using SNAP at farmers markets to get low-income people access to fresh produce (GrowNYC, 2018). GrowNYC oversees the greenmarkets and youthmarkets, another initiative where teens work with mid-size farms to get food to low-income areas. Another initiative taken by the local government is the Health Bucks program, which allows SNAP recipients to earn $2 coupons for every $5 they spend at farmers markets. All greenmarkets currently participate in the Health Bucks program, and research has shown that the implementation of wireless terminals to read Electronic Benefit Transfer (EBT) cards and the Health Bucks program have increased the amount of SNAP benefits spent at the GrowNYC farmers markets (Baronberg et al., 2013). These programs and initiatives have been incredibly successful at getting more fresh produce into the hands of low-income NYC residents. Recently, both issues with the app through which SNAP is processed and poor legislation are threatening to undo all the progress being made in food access. The Novo Dia Group is a company that processes around 40 percent of SNAP transactions at farmers markets, including the New York City Greenmarkets, through its Mobile Market Plus app. On July 31st, this company will be shutting down, leaving all its beneficiaries with no way to use their EBT cards at farmers markets (UPDATE: on July 27th, the NYS government has decided to support the payment service until the end of February). The contract needed for the company to run without losing money was instead awarded to another start-up company, one with only one employee and a virtual office, which is unable to process the SNAP transactions as the Nova Dia Group could (Black and Douglas, 2018). While Governor Cuomo sent a letter to the secretary of the USDA, critiquing the administration’s blatant disregard for those who are low income, one letter from one governor is enough. To preserve the work that has been done, please call your representatives and demand that they work to fight for a solution. While the times are defined by constant vigilance and constant phone calls to your rep, know that it speaks to your power as a citizen, and as a fellow human being fighting food injustice to pick up the phone and keep making calls. T., Williams, R., 2009. Access to Affordable and Nutritious Food: Measuring and Understanding Food Deserts and their Consequences. U.S.D.A., Economic Research Service, 1-116. The House We Live In: Race–The Power of an Illusion, 2003. California Newsreel, USA. Turk, B. J., 2017. Food Metrics Report 2017. Food Policy N.Y.C., 1-47.